A few weeks ago I got a message from a dear friend, KayLynn, from the old neighborhood we used to live in. KayLynn took care of my children during the time I left for work and my husband came home. She was amazing and willing to always help us out and my son loved her. I miss her dearly and wished we still lived close. 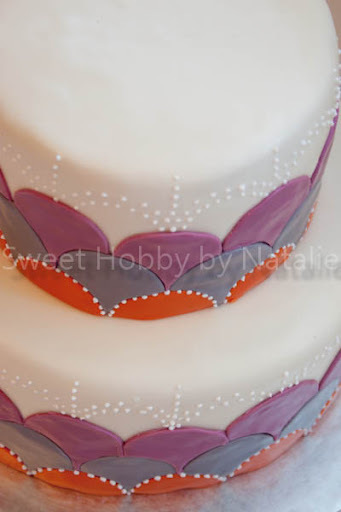 KayLynn's daughter was getting married and she wondered if I would do a small wedding cake. 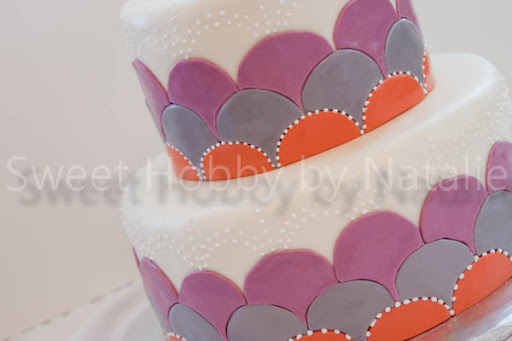 I asked my husband if I should do it since the few times I have made cakes I get a little crazy and all stressed out but I told him that I think I will be fine. 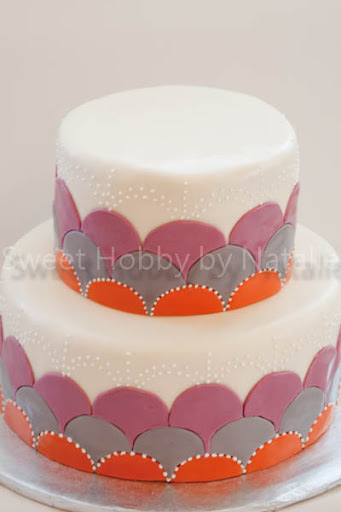 She sent me a couple of designs that they liked and I said I could do either but I also showed her a design I found in The Contemporary Cake Decorating Bible by Lindy Smith. I thought it would be cute with her colors and I have been wanting to try it out. They both liked it and so I went ahead with my preparations. I made butter-cream flavored MMF and I LOVED it. I could just cut it up and eat it as candy. I made a vanilla bean cake and did a raspberry cream filling on the bottom tier and a lemon cream filling on the top tier. It was a little stressful as the day I was covering the cakes with fondant, the lovely weather decided to rain and be humid. I live in the dessert and humidity is something we usually never have and I think it made the fondant a little difficult to work with. But I powered through it. I am so grateful to KayLynn for trusting me to do her daughters wedding cake especially since it was my first wedding cake ever!! 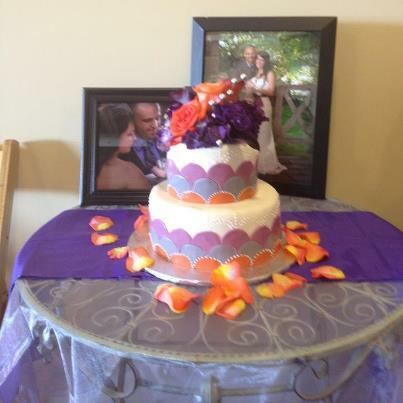 They added their own flowers to the top and here is a picture they sent of the displayed cake.